Israeli soldiers abducted at dawn Thursday and late on Wednesday at night, two Palestinians, including a writer and activist, from their homes in occupied East Jerusalem. The soldiers invaded the home of Abdullah al-Kiswani, a former member of the Palestinian Football Association, in the at-Tour neighborhood overlooking the Old City of Jerusalem, and abducted him, after searching his home. 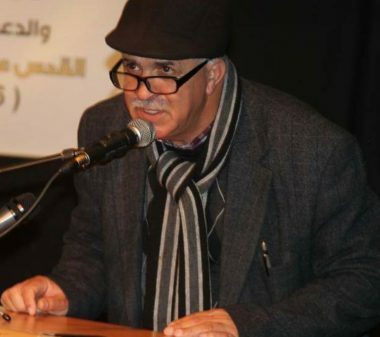 In addition, the soldiers abducted Palestinian author and intellectual Rassem Obeidat, 60, from Jabal al-Mokabber neighborhood in Jerusalem. Obeidat was summoned for interrogation in the al-Maskobiyya detention and interrogation facility, and was abducted shortly after arriving there. It is worth mentioning that he was among several Palestinians who were held, and interrogated, last Monday, after a large police force and intelligence officers invaded a hall of the Ambassador Hotel, in occupied East Jerusalem and attacked a celebration held by the Palestinian Russian Friendship Society. On Thursday at dawn, the soldiers abducted ten Palestinians in the West Bank governorates of Nablus, Bethlehem and Hebron, after the army stormed and violently searched many homes.